I read with horror today an article in the Houston Chronicle entitled "Commissar O'Keefe's Hubble Trouble". If the title of the article did not alert you to the nature of the upcoming article then the first sentence, proclaiming that "NASA chief Sean O'Keefe is a piece of work" would. Mr. Cragg Hines, a reporter for the Houston Chronicle begins by calling the potential for a robotic servicing "a pipedream." He goes on to imply that any discussion by NASA of such a mission as a ruse to get an administrator who did not understand the public outcry at canceling Hubble to calm a political storm until after the election. My good friend Dr. Robert Zubrin chimes in as the scientist with sufficient gravitas to back up these assertions proclaiming that "no one outside of O'Keefe's direct orders agrees with him that such a robotic mission is possible". Well Bob I am not under O'Keefe's orders and I agree and attest that it is possible. A team that was put together under the auspices of my company, SkyCorp Incorporated and our European company Orbital Recovery has come up with a solid mission plan that meets ALL of the requirements of the now cancelled SM4 mission and allows for the servicing of Hubble in perpetuity by crews from the Shuttle or from the International Space Station. Orbital Recovery is already in an intensive design study with our prime contractor Dutch Space, funded by Orbital Recovery with matching funds by the European Space Agency ESA. To digress slightly, for our commercial market we have a robotic servicing system called CX Orbital Life Extension Vehicle (OLEV) who's express purpose is to rendezvous and dock with a GEO communications satellite and extend its life by taking over attitude control and station keeping for up to ten years. We have our launch contract, our prime contractor busily at work, as well as our insurance and financial advisors. We have a license from the German Space Agency DLR for flight qualified robotic hardware and software that has been or will be flown within the next 18 months that can easily be adapted to docking with Hubble. We are also in negotiations with a major potential customer for other aspects of a mission that are compatible with servicing Hubble. Therefore I submit that at least for a tremendous number of the technologies embodied in such a mission we are already in progress to accomplish, for a commercial market, many of the things necessary for a Hubble robotic servicing mission. This will all be flight tested before a proposed Hubble mission. However, our team looked at the problem, and after a fashion agreed that the CX OLEV and a fully robotic servicing mission to Hubble to accomplish all of the goals of the SM4 mission were not at the Technology Readiness Level (TRL-5) as called for in NASA's recent RFI that could be made ready for a deployment by 2007-08. Therefore our proposal to NASA (We were one of the 26 respondents) is to construct an Xenon Hall Thruster based solar electric tug that would be assembled at the International Space Station, transit from there to Hubble, rendezvous and dock, and then transit back to the orbit of ISS where a Shuttle logistics Mission to ISS could carry the new instruments already near completion to Hubble and service the telescope. This would accomplish ALL of the goals of the SM4 mission while retaining Mr. O'Keefe's requirement to use ISS as a safe haven. This would also not cost a dedicated Shuttle mission and hence would save an amount of money that is larger than the cost of our system that such a dedicated flight would entail. Our plan leverages off of the work that Orbital Recovery already has under contract and meshes this with work that SkyCorp has pioneered in the arena of on orbit assembly and Hall propulsion for spacecraft as well as NASA's incredible success in assembling the ISS. Our plan envisions the construction at ISS of this solar electric tug with up to 88 kilowatts of power, with solar arrays borrowed from high power commercial communications satellites, Hall Thrusters from a major American aerospace company, robotic technology from both DLR and the company that successfully built the hardware performing so brilliantly on Mars on the two rovers Spirit and Opportunity. We have two former astronauts with several Shuttle flights between them including experience with satellite rescues, working with us to make this flight a reality. We will also work with other European Space companies like Swedish Space Corporation, that provided the computer system and software that is guiding the Hall Thruster based SMART-1 spacecraft successfully to the Moon. The U.S. no longer has a monopoly in technology in this area and indeed in many areas ESA and European efforts are pulling ahead of NASA and the U.S. DoD. This is truly a beyond this world class team with the demonstrated skill in all of the areas that apply to a Hubble mission such as we propose. 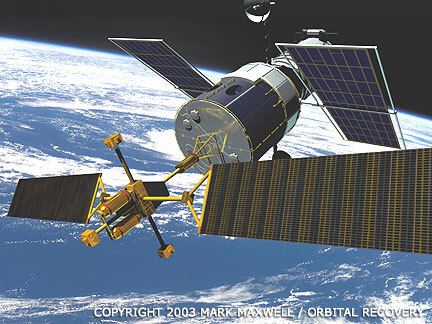 The mission would be to have the Hubble Transfer Autonomous Vehicle (HTARV), do the plane change from ISS to Hubble, rendezvous and dock with Hubble, raise its orbit to an optimum and then perform the 3 km/sec plus delta V maneuver to bring Hubble back to the orbit of ISS where the Shuttle or ISS crew could service the system at their leisure. This would achieve all of the SM4 objectives. During the servicing mission the crew would also replace the Xenon fuel canisters with fresh fuel that would be used to boost Hubble to whatever optimum orbit that Bruce Beckwith's HST Institute feels appropriate. Afterward, periodically Hubble could be serviced in perpetuity by either NASA or a private non profit organization. I am quite sure that there are philanthropists out there who would fund such a worthy cause after NASA brings the James Webb Space Telescope into operation in 2011. After all we still use the 5 meter Palomar telescope seven decades after it was first put into operation and eclipsed by much more powerful systems in Hawaii and South America. To us the most valuable part of our proposal is that after the Hubble rescue is accomplished we can bring the HTARV back to ISS where it can replace the Russian Science Power Tower that currently is not funded. The HTARV would be able to supply ISS with up to 50 kilowatts of additional power for science and exploration activities carried out at ISS. It would also be able to reboost ISS for a fraction of the cost of bringing conventional liquid propellants to ISS on the European ATV or Russian Progress, thus freeing up this valuable upmass for dry cargo for maintenance or human consumption. Later the HTARV or its sibling could be used to ferry an L1 outpost space station to that orbit as a waypoint and safe haven on the way to the Moon or Mars. An L1 station where spacecraft, manned or unmanned, can be refueled, would lead to a doubling of the payload delivered to the Moon and even greater gains for Mars. This I think may be at the root and core of my friend Bob's objection of a robotic servicing mission. It invalidates Mars Direct. A robust infrastructure of an ISS, an L1 outpost/gateway, and a vibrant Lunar resource utilization depot on the Moon, makes Mars Direct obsolete with its dependence upon a Saturn V class heavy lift vehicle. This infrastructure makes the Moon an important location for the production of fuel and even hardware for a Mars mission, just as President Bush spoke of in his January 2004 speech. Mars Direct as a mission architecture has as its fatal weakness, a dependence upon a heavy lift launch vehicle requiring over $10 billion dollars in development with its first launch more than a decade away. For that same price and quicker than that time we can place this infrastructure elaborated above into place for a lunar landing. An on orbit assembled HTARV would advance the President's agenda for exploration, save the cost of a dedicated Shuttle mission, and meet all of the requirements of the cancelled SM4 servicing mission for no more than the cost of the original deorbit mission announced a few months ago. This project would involve JSC, MSFC, GSFC, and NASA Langley, in a project that would provide an intelligent mix of manned and robotic spaceflight. My friend Bob and Cragg Hines darkly hinted to the Houston community that if the robotic mission to Hubble was approved it would be tantamount to the closing of JSC and the shuttering of manned spaceflight. Nothing could be farther from the truth. More than 50 years ago Werner Von Braun and Walt Disney made television programs showing robots and people working together at a space station to assemble a fleet of spaceships for trips to the Moon and on to Mars. Finally today with the ISS in the air we have a chance to realize this dream, a much more cost effective dream than the flags and footprints of Apollo or a like constructed successor. Von Braun lamented the loss of the original space station idea and the infrastructure for the future that it represented. Also, few are remembering the warning of then Marshall Space Flight Center director Mr. J.R. Thompson in 1986 after the Challenger disaster where he warned that we would lose another orbiter during the construction of the ISS. A similar warning was given during the CAIB hearings that before the ISS is finished we will lose another orbiter. Mr. O'Keefe has listened to the warnings and has adopted a prudent path to successfully finishing the ISS and then retiring the Shuttle system in favor of a more robust and safe successor. I submit that Dr. Zubrin and those who favor a Shuttle only solution did not hear those warnings, just as they did not after Challenger. A robotic Hubble mission such as what we propose is not a pipedream, it is based upon hard nosed engineering, and a great deal of proven flight hardware, that can be built and flown within a reasonable time to save Hubble. I have sat with Dr. John Grunsfeld in an office in Houston and heard him say that he would risk his life for science myself. He is an honorable man and he understands what is truly at stake if we lose another orbiter on such a mission. His comrades in Houston can get the best of both worlds with science and exploration together while reserving the Shuttle for its important task of finishing the ISS before its retirement. A Hubble rescue and the follow on operations of the HTARV may well be JSC's finest hour in a post Apollo world in contributing to executing the President's vision for our space future. We will go to the Moon, and on to Mars, with robots and humans working together, each contributing roles appropriate to their strengths. We go to Mars to extend human civilization to another world: we return to the Moon to save civilization here on this world. 20 August 2003: Space Tug to NASA's Hubble Space Telescope's Rescue? Dennis Wingo is Chief Technical Officer of Orbital Recovery Corp. This article does not necessarily represent the views or opinions of SpaceRef Interactive, Inc.